GMM UV coatings offer many advantages like Low Odor, Best characteristics, High gloss, High Scratch & Scuff Resistance and High Chemical Resistance. It can be applied through Roller, Curtain, Spray & Robot Spray. 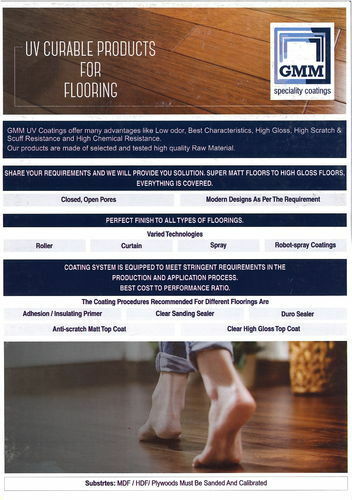 It is to be use on MDF/HDF/Plywood/Malamine/Laminats/Hard Wood. We have High Gloss & Matt Finish coating as well. We GMM Coatings Private Limited, established in the year 2010, are among the prominent manufacturers, importers, suppliers and exporters of an extensive range of optimum quality Coating Materials. The coating material range offered by us is inclusive Of Non-Stick Coating Materials, Industrial Coating Materials and Specialty Coating Materials. The inputs, which are best in the market, are used for processing these coating materials. To ensure high standards of quality, we import the products from Germany, USA, Singapore, Hong Kong and China. Owing to our large production capacity and well-equipped warehousing unit, we have been able to offer these coating materials in bulk quantities. The offered coating material range is known for its low friction, longer shelf life and resistance to heat, dust & water. We have been able to attain a remarkable position in this industry within a short interval of time due to our ethical business practices, customer-oriented approach and transparent transaction policies. Some of our trusted customers are Wilton and Calphalon. We have successfully exported our coating material range across the globe to several countries like Dubai, Bangladesh, China, Hong Kong and Turkey.